Behind the Scenes: What’s it Like to Fly Private Jet? Did you know Flight Centre can book private jets? Our Travel Experts have some great tales to tell: from booking trips to Costa Rica so a customer could view a prospective house, to arranging an elite flight to Ibiza, to flying a family to St Lucia for a spontaneous beach holiday. So what’s so great about private jets? Loads apparently! ACC breaks it down for us below. TIME-SAVING: Queuing for security, immigration, boarding and baggage claims means valuable time wasted. While you still have to go through the same process, having your bags x-rayed etc., if you’re using a private terminal or fixed base operator (a private jet terminal at an airport), this can be expedited to just a few minutes – no queues, no hold-ups, no hassle. FAST AND EFFICIENT: Private jets’ higher cruising altitude compared with commercial airliners means increased speed and reduced congestion, getting you where you need to be faster. UNRIVALLED ACCESS: Commercial airliners serve around 550 airports. A private jet can land at more than 5,000. Not only are you more likely to find a departure airport closer to home, you’ll gain access to parts of the world you otherwise couldn’t reach by air. 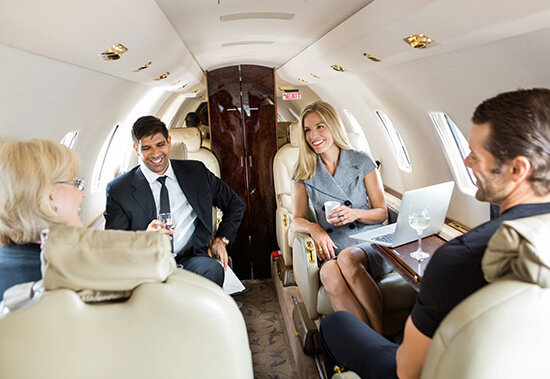 SUPERIOR FLEXIBILITY: Flying by private jet puts you in control of your schedule. Meetings in multiple cities become a breeze, and sudden changes can be accommodated at a moment’s notice, even when you’re already in the air. PRIVATE BY NAME: Every detail is planned to ensure the utmost discretion. Upon arriving at the terminal, you’re only seconds away from stepping aboard the aircraft – and once onboard you can relax in total privacy. UNCOMPROMISING COMFORT: It goes without saying that, when you fly by private jet, the journey is just as important as the destination. The highest levels of service, exquisite interiors and bespoke fine dining options mean you can enjoy a tailored experience designed to exceed every expectation. 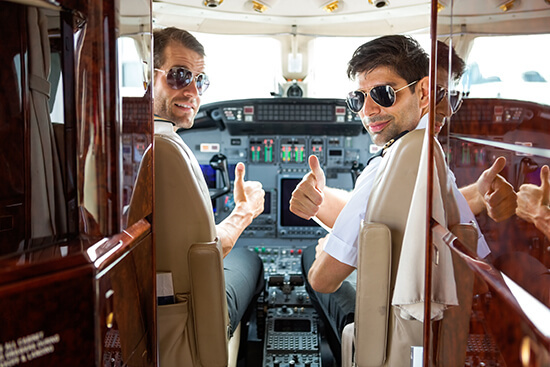 SAFE HANDS: Reputable private jet operators have impeccable safety records, enforcing safety management systems that easily rival any commercial airline. Additionally, they recruit only the best pilots via an arduous selection process, so you can rest assured that you’re in the safest of hands. The range of industries that make use of private charters is incredibly varied – there are the more ‘traditional’ clientele, such as HNWIs (high net worth individuals), big business, sports teams and the film and music industries. However, we have chartered a number of flights for emergency medical situations too. Even airlines charter – when a plane goes ‘sick’, quite often engineers and replacement parts need to be transported at short notice. In these cases, a client will need those resources airborne within just a few hours. Does that mean it’s expensive? 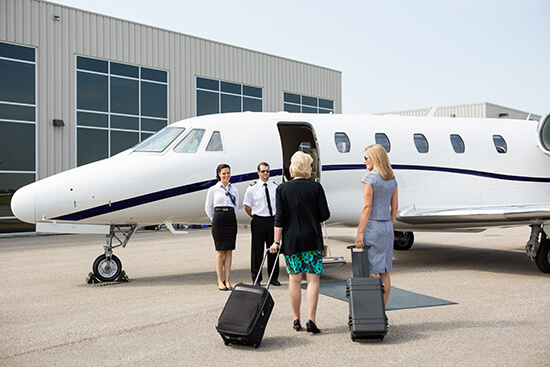 Actually, chartering by private jet can be surprisingly cost-effective, especially when embarking on a multi-leg journey, such as a roadshow, where time is of the essence and flexibility is paramount, or flying into a destination that isn’t serviced by scheduled operators. Chartering as part of a small group can also allow you to use a smaller, less expensive aircraft, while spreading the cost. Additionally, if you can take advantage of a one-way empty leg, the cost of chartering is often significantly less. The seating largely depends on the type of aircraft you’re chartering. Smaller planes, such as air taxis, are designed to seat between four and six passengers for journeys between one and three hours in duration, so lie-flat seats are out, but they’ll generally be more comfortable than those found on your typical scheduled service. The larger the aircraft, however, the more space you’re likely to have - and the more luxurious the seats are. It also depends on the configuration that the owner has chosen – just because you have two aircraft of the same make and model, it doesn’t mean they’ll necessarily be able to accommodate the same number of passengers. Do you still have to use a seatbelt? Wearing a seatbelt is a safety standard across the aviation industry, especially during take-off and landing. Again, the size of the toilets is entirely dependent on the size of the aircraft – these can range from emergency facilities to a fully-enclosed bathroom similar to those seen onboard a commercial airliner. Some smaller planes used for short hops aren’t equipped with these facilities at all so, if this is a requirement, it’s always best to check with your charter consultant. LIGHT JETS: Snacks up to cold meals. MID-SIZE JETS: Snacks and cold meals. Some may be equipped with an onboard microwave to heat meals up. LARGE/HEAVY JETS: Usually equipped with a full galley, capable of serving meals on par with long-haul scheduled services. But what is it really like to be a private jet passenger? To answer this question we spoke to Flight Centre customer Alyson Griffin, who has flown private jet three times with friends. 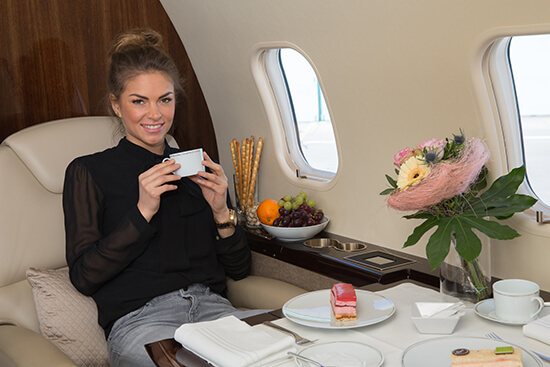 She told us: “Flying in a private jet is a treat which once sampled, always wanted. “Once, I remember that the pilot of our flight came and introduced himself and said that he was ready when we were. We finished our coffees, a porter wheeled our luggage to the plane and we followed. “When we were in an eight-seater, I remember that the plane was really quite small. Our luggage was in the back, near the toilet. As it was a short flight that was okay, but on a long flight, it would have been a real effort to get to the bathroom. That said, the seats in the plane were leather; after take-off the co-pilot jumped up and opened the Champagne for us; and we also had a very nice gourmet snack lunch. 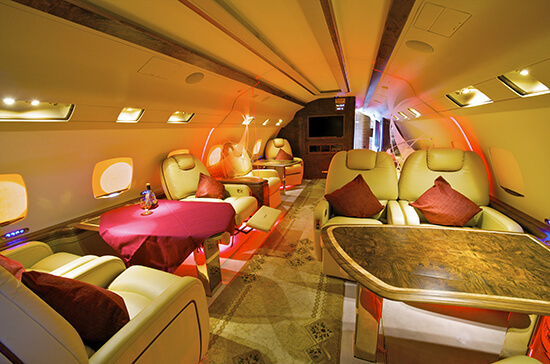 Intrigued about flying private jet? 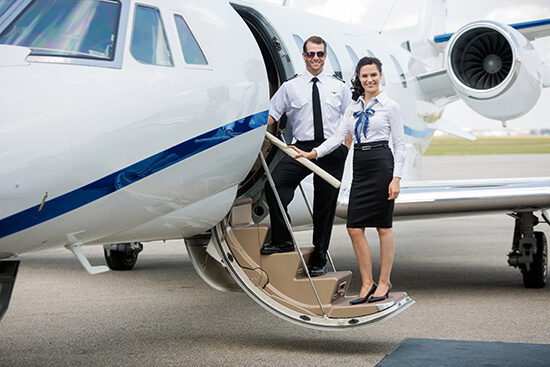 Speak to one of our Airfare Experts today and find out how you can charter a luxury flight without the huge price tag.